Central Saint Martins' graduate Magda Sabatowska has devised a cooking kit to help isolated elderly female residents of housing estates in Poland socialise with their neighbours. The kit is paid for as a subscription service that both the neighbours and the elderly residents can subscribe to. Neighbours can pay for their meals with money or by doing tasks such as doing some grocery shopping for the elderly resident or fixing things around their house. Through this exchange, BA Product Design graduate Sabatowska believes that the women can benefit from frequent social interactions, and will be able to integrate themselves more easily into the community. The kit is packaged in a cardboard box and includes a welcome pack explaining health and safety procedures as well as how to unpack and use the kit. It also includes allergen cards, a recipe notebook, and a menu sign to hang on the door of their home notifying the neighbours of the meals and activities happening that day. Subscribers are provided with take away boxes and stickers for packaging the food as well as a contactless card machine and charger for taking payments. 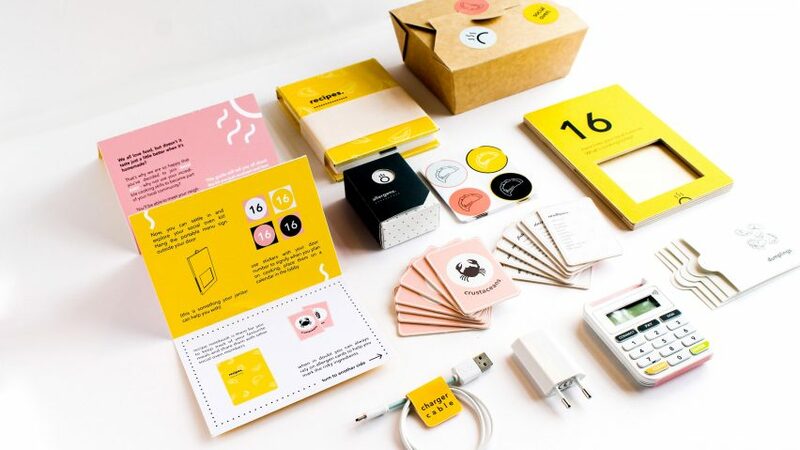 The packaging, which uses a colour palette of yellow, pink, black and white, features familiar food motifs and pleasant textures to assist the user in setting up and encourage them to navigate the neighbourhood. After purchasing a subscription, neighbours are given a Social Oven card that provides them with an equal allowance of money and neighbourly favours, so they can decide how they’re going to pay for their meal on any given day. Sabatowska, who grew up in Poland, said that her project responds to the Polish traditions that she grew up around, where elderly women were, and she says generally still are, in charge of preparing meals for their families. "The brief was to reimagine healthy ageing," Sabatowska told Dezeen. "I felt it was important to design for a reality I was already immersed in, and so designing specifically for elderly women in Polish housing estates was a conscious choice, supported by a variety of social and economic aspects." "I was particularly interested in what happens when families no longer live with their elderly relatives or have the time to visit," continued Sabatowska. "A lot of the women I spoke to suffer from depression and lack purpose in the final years of their lives, as they don’t have anyone to care for anymore." Sabatowska focused the project on housing estates as she said that they are the most under-served housing sector yet have the largest percentage of elderly living in them. Through conversations and interviews with locals, Sabatowska found out that the sense of hospitality that used to exist among neighbours "five to 10 years ago", is now practically gone. "I was lucky enough to have trialled the kit in Poland, on a small scale," Sabatowska said. "Being able to actually see the ladies I've interviewed interacting with the final models was priceless. We have done a couple of successful meal-favour exchanges and definitely stimulated the neighbourhood, feeding everyone dumplings." "As for the future, it's all in the hands of my client now, I'd love to be able to evolve it properly and see it work in various scenarios and hopefully I'll get a chance to do that with them," she continued. Last year London's Design Museum commissioned six projects to tackle the challenges of ageing populations. The resulting products included a scooter that doubles as a trolley bag, an intuitive robot companion and a garden room dedicated to conversation.